Artist, writer and general all ’round creative type Ben Templesmith might be best known for his atmospheric art which has featured in 30 Days Of Night, Welcome to Hoxford, Wormwood: Gentleman Corpse, The Squidder, Singularity 7 and Gotham By Midnight amongst other projects , recently though the artist has been stretching out into other creative avenues like clothing. 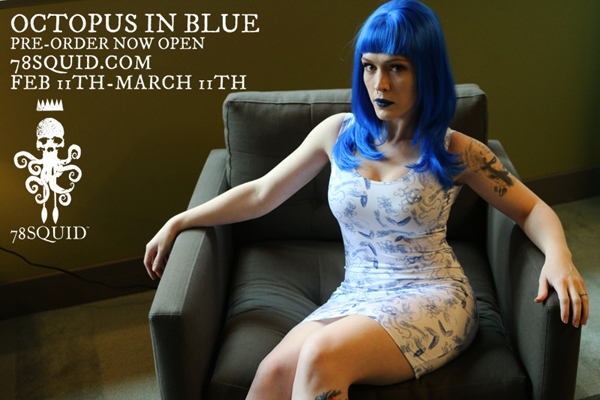 Following the success of the previous squid inspired collection dubbed “TENTACLE RISING” Templesmith is back with another collection named “OCTOPUS IN BLUE” (seen modeled by Ashley Templesmith) which is available for pre-order now. Crowdfunding the highs and the lows of being a backer – a cautionary tale.